It was Leonardo Da Vinci that famously said that "art is never finished, only abandoned". The idea behind that statement is that the creation of any work of art is not about crossing some kind of imaginary finish line but rather about realising in concrete form an image or idea that was held in your mind so that the world can see what you see. Since most artists lack the skill to perfectly realise their vision, they simply do their best before moving on. According to Da Vinci, an artist is never completely happy with their work and thus never considers it to be actually finished. I believe that Da Vinci's idea translates directly into the business world and that you could rightly say that a project is never finished, only abandoned. I've always felt that creating successful and lasting change within organisations through projects is just as much an art as it is a science. When, for example, you are attempting to create a new product or service. reorganise a business function or reenvision a brand, execution requires real creativity. You are grasping to realise in concrete form the image and idea that, until that moment, you and your team had merely held in your minds. It requires a special set of skills that are different in kind to the skills required to run a company in "business as usual" mode. Successful project management, perhaps more so than traditional business management, is as much art as science. Now, I've worked as a project manager for almost a decade. I was trained in the PRINCE2 project management principles and I am aware that one of the defining features of a PRINCE2 project is that is finite. It has a defined start and an end and it is the finite nature of a project that distinguishes it from normal operational management approaches. However, I believe that this sense of closure is artificial and potentially dangerous. At the point of project closure, although a successful project will have delivered the project outputs that were planned for, the vast majority of the benefits will remain unrealised. Indeed, if you were to analyse why you had conducted a particular project, you would find that you were pursuing an underlying, unachieveable ideal. For example, your project output might be a new business website. You initiated the project so as to improve sales and customer experience. Although a good project business case would nail down in a very tangible and measurable way the estimated business benefits you hoped to achieve through a website (e.g. increase conversion rate by 1% and increase average visit duration by 25%), the underlying goal cannot ever be fully realised or said to be finished. Rather, you simply either stop work or stop measuring the impact of the project at some point, effectively abandoning the project. This was one of my greatest frustrations as a project manager within large corporations. The project outputs would be handed back to the business and responsibility for how these outputs would be used and thus for benefit realisation would be handed back to the teams that operate the business on a day to day basis. At this point, I would be assigned to another project, often so large and involved that I simply had to abandon the previous project and just hope that the benefits anticipated in the business case for the project actually materialised. In many cases they did (eventually!) but in others they didn't but and these projects remained a source of professional disappointment for me. Reflecting on why some projects were more successful than others, I've concluded that there was a culture within the organisation for which I worked before becoming a small business owner of moving rapidly from one project to the next and never looking back. There was no effective process for benefits realisation. Most projects only addressed benefits realisation in a perfunctory way in the project closure stage, maybe scheduling a time when the board would review the benefits to ensure that the project had delivered according to the expectations set out in the business case. However, these benefits reviews were often forgotten or removed from the board meeting agenda in favour of more urgent, current issues that needed to be discussed. I believe that it was this failure to review the actual delivered benefits with the anticipated benefits of these projects and make adjustments to the project output based upon that if there was any discrepancy. Why is it so dangerous to stop and move on to something else once project outputs have been delivered? 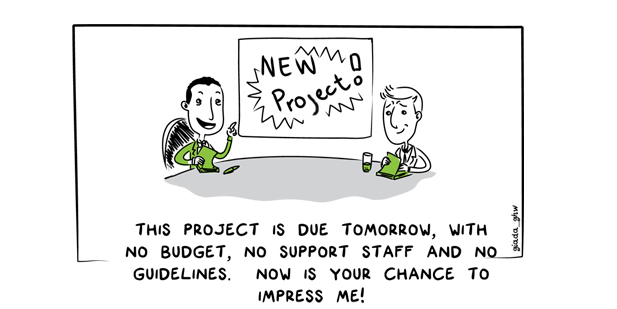 Simply because projects often fail to deliver the anticpated benefits. The reported failure rate of change initiatives to deliver the benefits anticipated in their business cases is 70%. Actually achieving the business benefits for any project requires people (e.g. managers, employees, customers or suppliers) to change their behaviour and this is not easy. People are naturally resistant to change and often have a vested interest in how things are at the moment. Where substantial change to an organization is happening, a project manager needs to include as much of the transitional and organizational support work within a project as possible within the project plans. They could, for example, define deliverables for the design and rollout of training, revisions to procedures and role descriptions, the negotiation of maintenance contracts, setting up of help desks and modifications to systems of reward and remuneration. Doing so ensures that budgets and human resources are actually allocated to these tasks and that control and monitoring systems are applied for their proper executionn. For each task that is required for realising a business benefit and that is not included as a deliverable from a project, make absolutely certain that the responsibility for its completion is attributed unambiguously to the appropriate Business Owner and followed through. Projects are the means by through which change happens within any organisation. Traditional project management methodologies like PRINCE2 consider a project to be closed when the project product is accepted by the business. However, unless benefit realisation is planned for and properly managed, these projects may end up having failed to deliver on the anticipated benefits in the business case that justified it in the first place. If benefit realisation is a concern for you in your business, then please don't hesitate to contact us here at Continuous Business Planning to see how our unique approach to the planning and execution of project work could benefit your business. We won't abandon your business, but will work with you until we see the anticipated return on investment. We are so confident that our approach will work for you and your small business that we offer our 500% ROI guarantee. Put us to the test and reap the rewards in your business. Read comments below or add a new comment below.